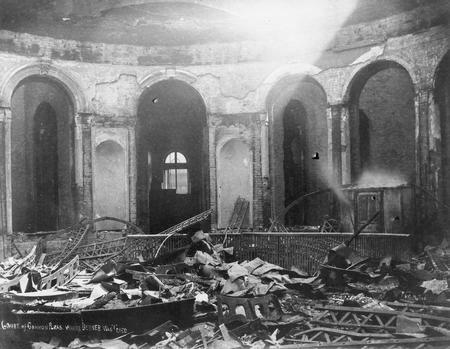 Interior view of the Court of Common Pleas in the Hamilton County Courthouse after it was damaged by fire, Cincinnati, Ohio, 1884. The fire was started during a riot sparked by public outrage over the outcome of a murder trial. For three days in 1884, Queen City citizens transformed their city into a war zone of deadly magnitude. From March 28 through March 30, 1884, law enforcement officers and Ohio National Guardsmen engaged in intense street fighting with mobs of Cincinnati residents that left more than forty people dead and over one hundred injured. The Cincinnati Courthouse Riot was rooted in a corrupt political system that failed to control crime, which was rampant in the city during the late 19th century. Political leaders earned reputations for controlling elections and manipulating judges and juries in return for personal gain. Violent crime grew to such proportions in the 1880s that the Cincinnati Enquirer referred to the Queen City as a "College of Murder". By March 1884, Cincinnati residents had had enough. The evening meeting on Friday, March 28, in the Music Hall attracted thousands of people. Despite the efforts of community leaders to maintain order, the assembly got out of hand. When the meeting ended around 9:30, a large crowd marched on the jail with the idea of taking the law into their own hands and dispensing justice to Berner at the end of a rope. Anticipating trouble, Hamilton County Sheriff Morton Hawkins had thirteen deputies with him at the jail. When he received word that the crowd was moving toward the jail, he rang the riot alarm to signal the police around the city. That action had the unfortunate effect of attracting even more people to the scene. Upon reaching the jail, the crowd broke through the door of the jailer's residence and streamed up to the cell area looking for Berner, who officials had sent to the Ohio Penitentiary in Columbus earlier in the day. As the disappointed crowd in the jail began to leave, events in the street turned ugly. The city police whom the sheriff had summoned began arriving on the scene. The crowd turned the first police wagon away, but a second one containing Chief of Police Reilly managed to force its way through to the jail. During the ensuing melee, rioters fired several gunshots, one of which hit a seventeen-year-old boy in the head. Someone in the crowd threw a stone that knocked a police officer unconscious. Chief Reilly and his men escaped the wrath of the crowd by entering the jail through a tunnel connected to the courthouse. At this point, the character of the crowd changed from concerned citizens, intent on having their own brand of justice, to a mob bent on looting and violence. Rioters assaulted the jail, breaking in on two levels. The occupants escaped the wrath of the invaders by stationing themselves behind iron doors inside of the jail. Undeterred, the attackers began hammering at the doors. Fearing that the doors could not withstand the assault, Sheriff Hawkins called for relief from the Ohio National Guard, which had two companies on duty at the Cincinnati armory. Guardsmen, under the command of Colonel C.B. Hunt, arrived at the jail just after the intruders broke through the doors. As Hunt's men entered the jail through the tunnel, the rioters shot four of them. Firing over the aggressors, the Guardsmen pushed them back temporarily. When the mob launched a second attack, Hunt's men shot and killed the ringleader and managed to clear the jail. Having failed in their attempt to capture the jail from the inside, the mob attempted to set it ablaze from the outside. In response, Hunt sent some of his soldiers out and another gun battle ensued. This time three rioters, one police officer, and four Guardsmen were shot. This encounter ended as the police and soldiers cleared the streets near the jail. When the sun rose on Saturday morning, four Cincinnati residents were dead, an unknown number were injured, and several Guardsmen and law enforcement officers were wounded as a result of the previous night's events. Incredibly, the morning Cincinnati Enquirer trumpeted, "At Last The People Are Aroused And Take The Law Into Their Own Hands, Enraged Community Rises In Its Might." Their tune would change by the next morning. Sensing that the trouble was not over, Sheriff Hawkins called for more reinforcements on Saturday morning. Although only 117 of the 525 Guardsmen available in the Cincinnati area responded to the call, Hawkins had nearly 200 men on hand in case of renewed turmoil. Seeing that they had too few men to defend the jail and the courthouse, Hawkins, Hunt, and Reilly decided to erect barricades in the streets surrounding the jail and deploy their men at those stations, keeping some in reserve. Hawkins also took the precaution of asking Governor George Hoadly to deploy more National Guard troops to Cincinnati. Hoadly was reluctant to do so because of the expense to the State, and because he was concerned about endangering his political support in Cincinnati. Instead of deploying the troops at 11 a.m., when Hawkins first requested them, Hoadly spent the afternoon in Columbus consulting with leading Cincinnati citizens trying to gauge the nature and severity of the situation. To his credit, Hoadly did mobilize some units so that they could be deployed quickly, if necessary. Unfortunately, by the time Hoadly finally ordered the deployment at 5 p.m. the troops could not travel to Cincinnati quickly enough to prevent the disastrous events that occurred on Saturday night. Hawkins had good reason to expect more trouble on Saturday night. Saturday was a payday and with extra money at their disposal, some rioters were likely to be fueled by liquor. As darkness came, small crowds near the barricades began to swell and a few small skirmishes erupted as the jail's defenders awaited their reinforcements. Meanwhile, the growing mob turned its attention to the unprotected courthouse. Intruders broke into the treasurer's office and set it ablaze. The fire quickly spread to other offices. When firefighters arrived to fight the fire, the mob prevented them from doing so. Hawkins deployed some of his reserves to help the beleaguered firefighters. After one Guardsman was shot and killed, and another injured, the protectors retreated to the jail to await reinforcements, which by now were late. The first ONG reinforcements did not arrive in Cincinnati until about 9:30 p.m. These troops moved from the train station to within three blocks of the jail where they encountered the mob. Rather than pushing forward to relieve the defenders in the jail, the 300 men in this regiment instead retreated to the train station when threatened by the rioters. The regimental commander later faced a Court of Inquiry, which found that he was guilty of incompetence and disobedience of orders, and relieved him of command. Of course, that did little to assuage the immediate situation at the jail, which was becoming perilous as the mob's size and boldness grew. Sheriff Hawkins finally received the relief he had been awaiting somewhere between 10:30 and 11 p.m. Four hundred and twenty-five Ohio National Guard troops from Columbus arrived in Cincinnati armed with a Gatling gun and moved immediately to the jail. Along the way, the rioters pelted them with insults and stones. Upon their arrival at the jail, Sheriff Hawkins set out to clear the streets near the jail and the courthouse. His men were able to do so by pushing the rioters back and building new barricades, but not without a cost. Ten of the guardsmen were wounded by gunfire. Despite the increased presence of the Guard, the mob violence was not finished. Looting and vandalism spread throughout the city and fighting around the barricades continued to rage. After frontal assaults on the barriers proved unsuccessful, the rioters resorted to sniping at the defenders. Around 3 a.m., the violence finally began to slacken. By daybreak Sunday, the courthouse was in ruins, a smoldering testament to Governor Hoadly's indecision of the day before. The Governor was much more decisive on Sunday. Throughout the day, he dispatched nearly 2,000 Ohio National Guardsmen and 50,000 rounds of ammunition to Cincinnati. He also sent Adjutant General Ebenezer Finley to assume direct command of the troops. The Cincinnati Enquirer, which the day before had applauded the action of the crowd, now lamented the "Fire and Fury, The Reign of Terror" and "Awful Scenes in Cincinnati." Even though the governor was busy increasing the troop strength in Cincinnati on Sunday, the rioters had not yet had enough. Throughout the day, the crowd swelled again and tensions mounted. Finley correctly expected trouble to resume that night. The violence resumed around 8:30 p.m. when a group of 150 rioters began pushing streetcars off the tracks several blocks from the jail. Looting and vandalism also broke out around the city. The fighting increased between 10:00 and 11:00 p.m. when rioters began shooting at soldiers behind one of the barricades. When the rioters ignored orders to stop, the soldiers used the Gatling gun to scatter the crowd. The final outbreak occurred at 1:00 a.m. near a barricade on Court Street. Rioters fired over fifty shots as they advanced on the barrier, but the Guard did not respond immediately. Finally, as the mob charged the barricade the soldiers fired two volleys, and the crowd retreated, leaving behind several wounded. With that, the violence ended. The Guard reached its full strength in Cincinnati on Monday with about 2,500 troops on hand. The mayor closed the bars in town and when people returned to work there was no more violence. Finley began sending guardsmen home on Tuesday. The majority of the soldiers left town on Wednesday and a small contingent stayed until April 17.